Last week, I described the built-in PopupPanel object, and showed how it can be used to present popup messages with HTML content and even entire webpages. I explained that PopupPanel uses an internal browser object to achieve this. 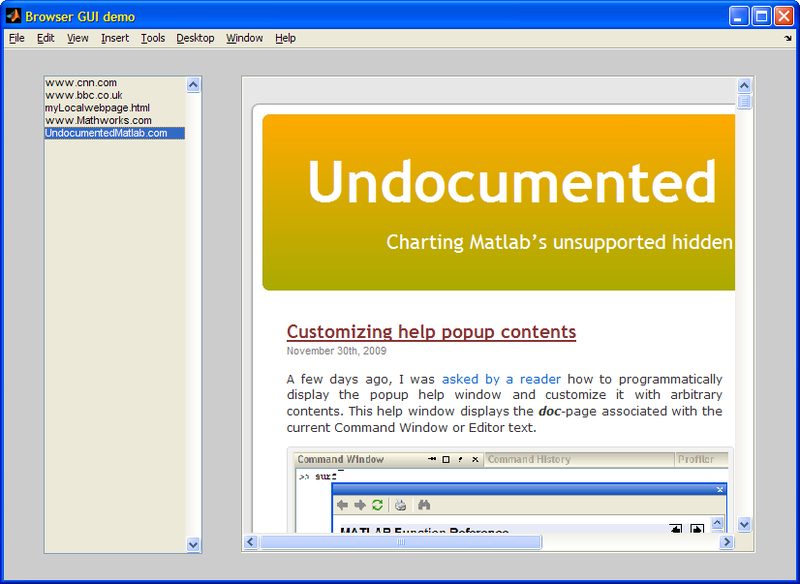 In fact, Matlab’s browser object predates PopupPanel by many years and quite a few releases. This browser object can be used as a stand-alone component that we can easily embed in our Matlab GUI applications. We can easily expand this simple example to display any HTML message or webpage, in a seamless integration within our GUI. Now, who ever said that Matlab GUI looks static or boring??? In an unrelated note, I would like to extend good wishes to Ken Orr, who has left the Mathworks Desktop development team to join Apple a few days ago. You probably know Ken from his good work on the Desktop and the official Matlab Desktop blog. Hopefully, in his new position Ken will be able to influence Mac Java in a way that will reduce the numerous recurring issues that afflict Matlab Mac releases. Thanks Yair! I’ll do what I can to help influence Java on the Mac. Thanks for a great tip! I have been struggling with the limited HTML capabilities of the JEditorPane but now you gave me a solution that really works out of the box. Is it possible to view non-html links, say, a pdf file from within the matlab web browser? That should be without opening a new acrobat reader window. @Sid – I don’t think so. Even regular browsers need to use Acrobat (or another PDF reader like Foxit) to display PDF. I will try to work on browser size, but i appreciate if you can provide some hints. I’m just reading your response to my post I wrote… 2 years ago. The need for a throbber was off the radar during this time, but finaly rises again, and your piece of code is actualy exactly what I was looking for. Thank you for your help, and continue to keep this extremly usefull website alive. I do have a slight problem – if the page I’m viewing has some dhtml pop up window, it shows like an error message and there’s nothing I can do – the whole program is stuck until I turn it off (click ok or something). http://www.domainscalping.com/ (simply let the page load, and then refresh the screen to see the popup). Is there a way to monitor such messages and handle them via the code? Or maybe disable them? Is it possible to track changes in browser object? For example, change listbox when we follow a link to another site. @Ivan – the easiest way would be to check whether the browser object (or one of its sub-components) has a built-in event (Matlab callback) that you can use. Alternatively, you could try using a property-change listener as explained here. In the “Database” drop down under the “Input” cell, select any one of the databases. It will load the data for that particular study. OBJECTIVE: Capture the text on the page for the time section of the study being viewed; the text in the blue bar just above the graphs (“Selected Input:”). PROBLEM: HTML text field in browser object is not updated after navigating away from welcome page. Need to find a way to get the HTML code that is specific to the study data that is being displayed. 1) Used uiinspect.m (http://undocumentedmatlab.com/blog/uiinspect/) to find the displayed HTML for the data page of the study. Can’t find any field containing the new info. 3) Right clicked on the page and used the “Refresh” option. This did not update the HTML text field of the browser object. It did keep you on the study page, and did not refresh to the welcome page, even though it had to resend the POSTDATA query. 4) Viewed the same page in Firefox and inspected the page source code. This gave me what I want; HTML code specific to the study. @thnxtay – I suggest that you load your webpage in some external browser that has more abilities to display the inner HTML code (e.g., Firebug on FireFox). Then you’d be able to see what goes on behind the scenes and try to use this info in the more-limited Matlab browser. If you would like further assistance on a consulting basis, please contact me via email. and indeed the html was opened with in internet explorer. Do you know how to disable or modify the popup context menu that I get when using com.mathworks.mlwidgets.html.HTMLBrowserPanel ? I’m deploying a compiled app with an HTML viewer component, and I don’t want the users to be able to click “Evaluate selection” on selected text. @Mike – this will require investigation. If you would like me to investigate this for you (for a consulting fee), send me an email. @Lichen – you need to download the relevant video into Matlab and process it in Matlab. You cannot directly interact with it on the webpage. is it possible to integrate GUI on a web browser?? could you please show me how to solve this? @Clara – There is no simple answer. You can have your webserver call Matlab (on the server-side) to generate HTML/images. If you need interactivity then consider getting the Matlab Production Server ($$$). @Bryant – this article is an oldie, written in 2009. Since then (I believe in R2012a) Matlab changed its internal browser to the new JXBrowser. This means that you will need to modify the above code. I did it some months ago and I remember that it wasn’t too hard, but I can’t remember at the moment exactly what I did and I do not have the code (it’s at a client). So either you try to modify the code like I did back then, or contact me by email for a short consultancy to recreate what I did. Could you tell how to download a video file to matlab from web browser? 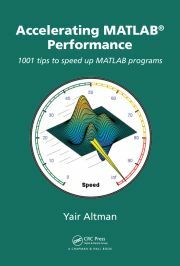 @Ragni – don’t do it directly in Matlab: download the video using external software, save it on your disk, and then load this file in Matlab. I have one more doubt. I have live video streaming running in Google Chrome browser. How can i import/read this live streaming to MATLAB such that I can read it using matlab function “inputvideo”. This page does not display correctly in your version of the MATLAB Web Browser. I’m using the 2013 version. thanks. more one thing, how to play a video with audio in a gui matlab? I have a little trouble using this component in a Matlab class UI I have developed: although I delete the java objects in my destructor, “jxBrowser Chromium Native Process” remain in memory, until I close Matlab. Any idea how I can properly cleanup that? Thanks very much I love your website, it is so helpful. I have a question.When I tried to run the above code it gives an error of Undefined variable”com” or class ”com.matworks.mlwidget.html.HTMLBrowserPanel” ıf you help that would be great. Thanks! @Nurden – of course Matlab gives this error if you mistype the class name (com.mathworks.mlwidgets.html.HTMLBrowserPanel) !!! Next time copy-paste from the blog, don’t try to memorize long class names! Sorry for taking your time, I found that mistake pretty shortly after I asked the question here. Now it works and I cant thank you enough. One more question; instead of a listbox, I would like to put a tree on the left side inside a panel so whenever I click on an item in the tree it would take me to a specific url that belongs to that item that I picked. I can create a tree with the help of other sources on the internet, but how can I put that tree in a uipanel? Any help will be appreciated. Thanks again! Lets assume there is a link to ‘www.cnn.com’ on the RIGHT side in the browser in above example(GUI integrated browser control) and when I click on it , it will start showing cnn website. How can I move the selection highlight (blue) on to ‘www.cnn.com’? in Matlab 2015a. Several times I found useful codelets in this page, thanks! I have a question. If the page is longer than the container, I need to scroll through. Can I track this scroll position in the webpage? Is this information available in any variable while scrolling? It’s not clear to me how to interact with HTML components from the resulting browser object. For example, if my HTML contains a simple form input box, how do I return the current string from the box? I imagine the procedure would be the same for a drop-down menu, or any other form component. Is there a way to get/set HTML form component properties?